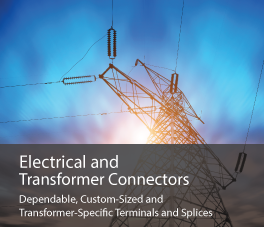 ASK has provided a full range of dependable and custom power connectors to the electrical and transformer industries for more than 25 years. That means while others have reduced or eliminated their line of large power connectors, we continue to provide custom-size, transformer-specific large power connectors, including the widest range of gauges to 2000 MCM you’ll find today. And we make it easy for you, no matter the size and scope of your company or project. We carry every part you’ll need – download our 2,500-part catalog, and if you’re not sure what part you need, visit our product configurator today. Made in America, dependable, UL certified, and competitively priced, our electrical and transformer power connectors are made to perform. Have a unique need or special service? We’ll help you with that, too. We’ll engineer and manufacture the custom parts you require, thanks to our in-house prototyping and tooling services. We can design and implement a stocking program to ensure you always have what you need, and we’ll be there for you when an emergency need arises, too. With ASK Power you can customize your solutions for YOUR application needs. Visit ASK Power's Production Process. 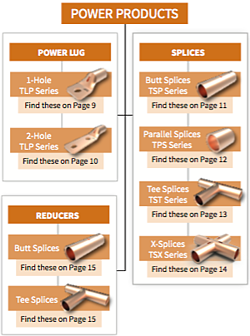 Download our new Transformer Catalog (form on the right) or see our new line of Compression Tools. OR Get it ALL from ASK Power! 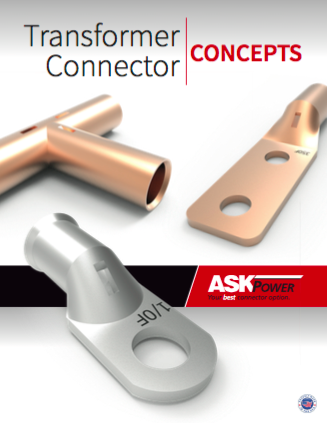 Your Best Option for Power Connectors, Power Your Connection with ASK!